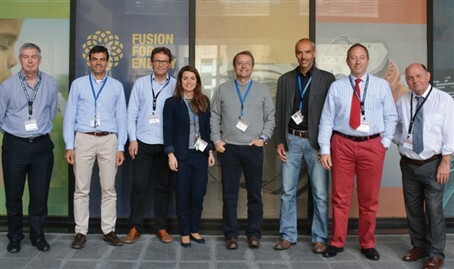 With the objective of producing a first-of-its-kind European superconducting magnet, F4E and British SME Cryogenic Limited have now started work together. This collaboration encompasses the design, manufacturing and assembly of a superconducting magnet (SCM) for the EU 1MW gyrotron prototype. The superconducting magnets will together with the gyrotrons form the source of power of ITER’s Electro-Cyclotron (EC) heating system which is responsible to generate the radiofrequency (RF) waves which will heat the plasma to the 150 million degrees C necessary for the fusion reaction to occur. The gyrotron is inserted in the vertical hole in the middle of the cylindered SCM, and the role of the SCM is to produce a very high magnetic field in order to allow the gyrotron to generate the RF power. In order to produce this magnetic field, the coils of the SCM must be superconducting and work at cryogenic temperatures (of around -269° C). Until now, European industry has been producing a type of SCM which uses a bath of liquid helium (called ‘wet’ magnets) that flows through the magnet system and through convection, cools down the coils to extremely low, cryogenic temperatures. However, F4E and Cryogenic Limited will use an innovative cryogen-free, ‘dry’ magnet technology which until now has never been used in Europe: rather than relying on cold liquid helium to flow within, the SCM will be cooled down by heat conduction by extracting the heat through strips of solid material. The SCM will measure a maximum 820 mm in height and the cylindered hole where the gyrotron will be places measures 240 mm in diameter, meaning that the supplier needs to keep the design of the magnet system very compact. The maximum value of the magnetic field on the SCM axis will be 6.77 Tesla, a significantly high value for this type of magnet. Furthermore F4E has specified in the contract that the magnetic field produced by the SCM should only vary 0.1 % of the required value. The reason for this tight requirement is that the gyrotron will not operate unless the magnetic field is within this range and necessitates that the design and mechanical construction of the coils of the SCM must be exceptional. “This is the first-ever magnet of this kind in Europe in terms of the precision of the magnet construction and the mechanical tolerances of the magnetic field”, explains Fabio Cismondi, F4E Technical Officer dealing with the SCM system. “The strict requirements on the magnetic field axial profile and magnetic axis position make the design and assembly of a ‘dry’ SCM for the gyrotron operation very challenging. The positioning of the magnetic field which is produced by the SCM in the gyrotron is very important: if the magnet is not aligned properly, the production of the RF power is compromised”. The final design of the SCM is scheduled to be concluded in October of this year. In parallel, the material and superconducting wires procurement will start. The manufacturing and assembly of the SCM is foreseen to be ready during the Autumn of 2016. After installation and acceptance tests, the SCM will be used to operate the 1MW CW gyrotron prototype (presently being procured by Thales Electron Devices) in the European EC Test Stand at the European Fusion Laboratory CRPP (Lausanne, Switzerland). Within the framework of the ITER in-kind contribution, Europe will have to provide 6 gyrotrons sets, i.e. 6 gyrotrons equipped with 6 SCMs (the additional 18 gyrotron sets will be provided by the Russian, Japanese and Indian ITER Domestic Agencies. The superconducting magnet (SCM) for the EU 1MW gyrotron prototype will be produced using a technology which until now has never been used in Europe.